Our tree was a Weeping Willow. Our song was “Midnight in Montgomery” by Alan Jackson. We even had secret names. This was the club I formed when I was eleven. We were all about ghosts. Scaring each other with stories; daring each other to go into the basement alone; even using the Ouija board in hopes of contacting a spirit. When I try to pinpoint the exact moment I became interested in the paranormal I have some difficulty. I remember as a child borrowing every book I could get my hands on from the school and public libraries. I’m sure the librarians and my teachers had an idea about what I might do as a hobby in the years to come but at the time, I just wanted to read anything I could find on the subject. I loved anything about ghosts, fairies and aliens. 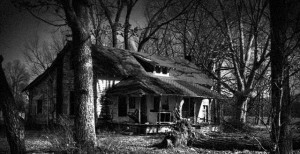 Some of my favorite stories included that of the Bell Witch and another called Angie. My grandmother was a huge influence on my paranormal obsession. She was an avid reader who would buy or recommend books that I might like. I still have her copy of Time Life’s “Mysteries of the Unexplained.” Photos and articles of UFOs, aliens, exorcisms and ectoplasm filled my head when I stayed the night at her apartment. She would tell me stories about being visited by my deceased grandpa at night. I would stay up in the bedroom just across the hall from hers and listen as hard as I could to see if I could hear him talking to her. I had a hard time opening my eyes though! And I will always love her gift of my first Ouija board. And I cannot mention my ghost hunting passion without mentioning my older sister, Dana. Because her mother lived in Douglas, she only stayed with us for short amounts of time. When I was twelve years old, she came to live with us for a year. She came from a ranch that had a permanent, spiritual resident named “Barney.” But Barney apparently followed her to our house. We were also told that he liked Reba McEntire and hated George Strait. Whenever either of the musical artists would be playing on the stereo, the volume knob would turn up or down accordingly. Little did I know that Dana had a remote that controlled the stereo system; she would use to scare my younger sisters and me. The funny thing about knowing this now is that my parents had paranormal experiences while Dana was living with us. My mother would hear footsteps upstairs on the wooden flooring; they would continue into the kitchen, down the stairs and come back up. And this would continue for almost an hour. She also felt someone watching her while she was in the bathroom. As I became older, I remember spending the night at friends’ houses or friends staying the night at mine and impatiently waiting until it was dark where we could tell scary stories, play “light as a feather, stiff as a board” and “Bloody Mary.” The latter of which got me kicked out of a bathroom in 4th grade because I convinced a bunch of kids to try it with me. Suffice it to say that my ghost hunting hobby has been a long time in the making. Then throughout junior high, high school and college, my fascination was set on the backburner because homework and work took precedence. However everyone knew that if they had a “weird” experience they could talk to me and find an engaged listener. After graduating college, I moved to Vancouver, Washington for a year. While I was there, I found a paranormal group online that was willing to let me tag along on one of their investigations. I could not have been more excited! I got off work at 9:15 PM and met them at an old hotel outside Vancouver. There must have been around ten members. We roamed the hallways, took a tour of the grounds and eventually wound up in a board room where they proceeded to grill me with questions. By this point I was already disappointed. Everyone had a camera and everyone was exclaiming about all the orbs they were getting in their photos. Even ten years ago I was not impressed by orbs. I don’t think the group was very impressed with me. They didn’t like my answers to their questions and I didn’t like that their “proof” of ghosts were the orbs they found in their pictures. We were not a good match. I left that night disappointed to say the least. I had found people that were excited about the same thing I was but I did not agree with their (and I’m using this term loosely) “investigative” method. I surprised myself however. I still called the group afterwards and wanted to be a member. They would not return my calls (which I can laugh about now but at the time my feelings were hurt!). I moved back home in May of 2003 through a transfer in my company. I was excited to be back. I still spoke about ghosts and hauntings but I was never active about investigating them. Finally in December of 2007 I became tired of waiting for someone else to start a group and started my own. When my youngest son was three, he had a visitation. My great-uncle passed away. Both my boys were very upset. That night my husband and I heard our three year old yelling. We ran into their room which was just outside of ours. He was sitting up and crying. We asked him what was wrong. He said that he didn’t want Uncle Wilson to go. We of course hugged him and told him that it was ok. We were all sad. Now remember that this is a three year old. What he said next we will never forget…..he said “NO, he was right here!” and he pointed to the entry to the bedroom with great fervor. Then he said “He said it was ok, that if I keep him in my heart he would never really go away”. Every hair on our bodies stood on end. We had never heard our son talk like this or say the things he had said. We have no doubt that he saw our beloved Uncle Wilson. Since then when we have been talking with family or friends and this story comes up there is always at least one that asks if we are sure that he didn’t just get this from TV or someone else. I have to say my husband and I have never questioned him on this. There is no way to prove it of course, but if anyone could have seen him that night they too would not doubt this as truth. One of my sisters also has a story involving a young child. Her oldest granddaughter was just four years old. We were all visiting them in Colorado and had taken our mother along. The little girl walked up to her grandmother and told her that she needed to tell Great-Grandma something. So they walked over to my mother and this little girl said “I talk to your mama”. My mom said “Oh you do?” The little girl then said “Ya, she talks to me and she tells me to tell you hi and that she loves you and that she comes to your house sometimes to check on you”. You could have heard a pin drop. We asked her questions about our grandmother. You might have known she nailed it. The interesting part is she had never met this grandmother. This little girl is adopted. Yes our family has had some interesting things like this happen. But if you talk to people you will find that a large percentage of them do have stories just like this. Why, you may ask do children see what we do not? From what I have read and researched, young children are more open to anything. They have not learned this is not normal for everyone. Young minds absorb anything that comes their way. So if a soul or spirit is lingering or is just hanging around, whom else would you go to if you were that spirit? My guess is the one that will acknowledge you. Do you have a story to share? Please send it in. We would all love to hear. October 22 and October 29. There will be four tours a night starting at the top of each hour beginning at 6pm. You must pre-register, but if interested do so now. Places are filling up fast!!!!! Call 307-875-3615. If you are calling for a group you will need each person’s name and phone number. New this year we are selling “I Survived the Haunted Library” t-shirts. Prices start at $10.00. All proceeds go to the SWCLS Foundation. Last but not least, by attending any of the scheduled Adult Programs now until October 20th, you can win a chance to attend the Ghost Walk. This is your chance to guarantee your chance to attend.